Over 100 years ago in southern California, Van Camp Seafood Company started canning the highly sought after white albacore tuna. Fisherman and customers began to refer to the tuna as the “chicken of the sea” because of the mild flavor and texture of the fish and the name stuck. Over the next few decades the company grew due to many factors including the shortage of fresh foods during both world wars, marketing efforts such as the Chicken of the Sea Mermaid campaigns, and as the health benefits of tuna and other cold-water fish became more widely recognized. The company continued to innovate as the years passed, staying on the cutting edge of product development, sustainability concerns, quality control, and employee safety. In 2000, Chicken of the Sea was fully acquired by Thai Union, a global seafood processing and distribution company based in Bangkok. To simplify logistics and improve the company’s ability to react to market demands, it was decided that the Chicken of the Sea packaging plant located in American Samoa would be moved to another location. Lyons, Georgia was selected from over 10 sites viewed by the re-location team because of its proximity to the Port of Savannah and the efforts of the Toombs County Development Authority. With over 250 employees, Chicken of the Sea is now the largest employer in Lyons and draws employees from over 13 counties in central Georgia. The company contributes greatly to the community, sponsoring local events such as the Vidalia Onion Festival and donating to charitable organizations such as the United Way, Great Promise Partnership, and the Sweet Onion Animal Protection Society. The Lyons plant can produce over 7 million cases of tuna per year, which means efficiency and a commitment to continuous improvement is important to maintain the plant’s operations. When Greg Riekhof, General Manager, joined the Chicken of the Sea team in 2016, he wanted to provide a fresh perspective and help generate new ideas by bringing in the Georgia Manufacturing Extension Partnership (GaMEP) at Georgia Tech, an organization he had worked with in previous manufacturing positions for nearly 30 years. Alan Barfoot, GaMEP’s central Georgia region manager, met with Riekhof and his team. During the initial assessment, they identified several areas of the plant that they thought could be improved using a series of lean techniques and hands-on projects. Over the next several months, the company worked with GaMEP project managers, David Apple and Charity Stevens. 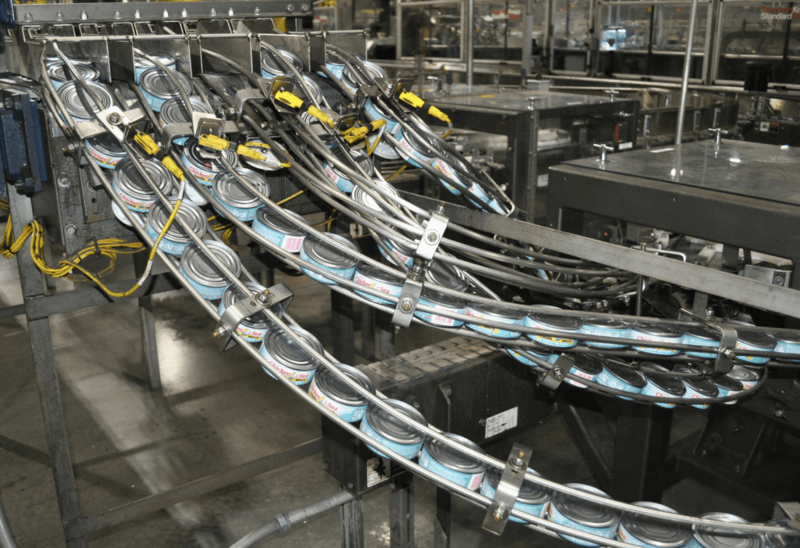 Apple helped them complete a value stream map of their canning process. From the map, they decided to dig deeper into their highest volume canning line using a set up reduction technique called, SMED (Single-Minute Exchange of Dies). Apple and Stevens worked with Brian Krafczyk, Continuous Improvement Manager, and a team of operators and supervisors on the line including, Mitch Hall, LaTonya Bacon, and Haley Phelps, to video and dissect the changeover into a series of essential tasks. They collaborated over the course of the two day project, to identify and eliminate waste within those tasks. In addition, the company was connected with Sinan Sinharoy, GaMEP Project Manager, who helped them apply for an energy audit through the Georgia-North Florida Industrial Assessment Center (a partnership between Georgia Tech, Florida State University, and Florida A&M University, that provides no-cost energy assessments completed by a team of staff and students from each university). After the one-day assessment, the team produced a series of recommendations that included simple, low investment opportunities, like turning off air compressors during off-hours, as well as longer term solutions that would require investment in new equipment. Overall, the report projected savings for the company of approximately $400,000 per year, due to lowered electricity, water, and natural gas bills. These initial projects also helped motivate the company to formalize and refine its daily improvement strategy. The management team developed a routine meeting with each department in the continuous improvement “war room” each morning and conducts daily improvement walks, and audits across the plant. They also implemented a system that triggers a root cause analysis, whenever the same issue is reported repeatedly. 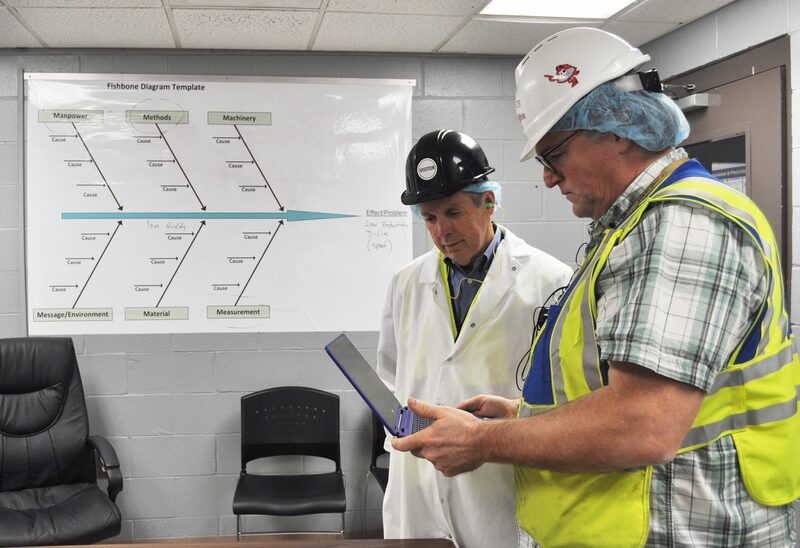 Guided by an emphasis on communication, innovative thinking, and the drive to meet and exceed their Key Performance Indicators (KPIs), the company has truly created a culture of continuous improvement at the Lyons plant. They have already made many significant improvements, but they look forward to continuing their journey as they add new equipment and products in the coming year. Alan Barfoot, Central Georgia region manager at the Georgia Manufacturing Extension Partnership, and Brian Krafczyk, continuous improvement manager at Chicken of the Sea, discuss the company’s continuous improvement program and safety training modules. Cans of tuna on one of the label and case lines studied by the SMED project team. Download the Chicken of the Sea Success Story Flyer.